There’s nothing worse than a lumpy protein shake after a rough workout. A smooth shake, on the other hand, is a delicious shake—and a perfect way to reward yourself for meeting your goals. So there’s no excuse to live your life without top-notch blending—and that’s what the FitMix Pro Portable Blender Bottle can offer you. 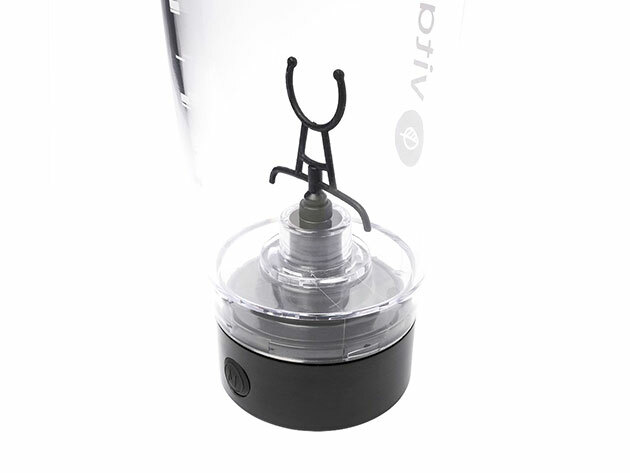 This portable, cordless bottle is designed specifically to blend protein smoothies. The propellers are driven by a 16,000RPM motor, which can turn any powder into lump-free deliciousness in just thirty seconds. The bottle is lightweight, so it won’t weigh down your gym bag. It’s also leak-proof, to provide awesome on-the-go nutrition. Plus, it conveniently uses two AA batteries, so you won’t have to worry about keeping it charged. It even comes with a protein powder storage cup and a flip top. You’re probably thinking: “But I bet that costs me $39.99, and I only have $27.99 budgeted for my next portable blender purchase!” Luckily, while $39.99 is the normal price, the FitMix Pro Portable Blender Bottle is available to you right now in the Muscle & Fitness store for just $27.99. Funny how that worked out, huh?